The "Tenerife" Masca Gorge 1-Day Hiking Tour with Picnic" starts at 8:30am. This hiking activity takes place 3 times a week throughout the year. We are comparing Tenerife Masca Gorge 1-Day Hiking Tour with Picnic Prices from leading ticket suppliers and Try to find you Cheap tickets prices on the market. The hiking experience through the gorge of Masca is a pleasant activity in nature. The tour leads through steep hills and walls and includes a dose of adventure. Regardless, many people in an ordinary shape don't find this hiking tour especially demanding. 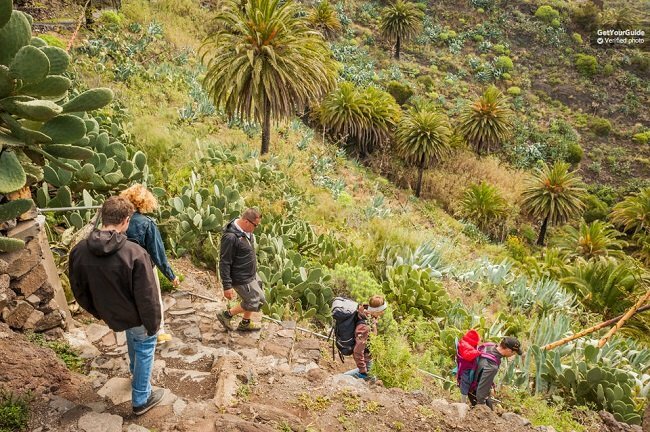 Along the way, hikers discover attractive wildlife and plant species characteristic to this part of Tenerife Island. You will also get a chance to examine a picturesque village of Masca. On the other side of the hiking path you will find a beach where you can take a swim. A boat will transfer you to the port of Los Gigantes from there. During the boat ride, you may see dolphins inhabiting these waters. Hike from Masca village to Masca beach lasts around 3 hours. This type of hiking activity is great for fans of nature, flora and fauna. It is an ideal recreation in an attractive environment. More so, hike through the Masca Gorge is a special treat for anyone who wishes to experience something different. Your Experience With Tenerife Masca Gorge 1-Day Hiking Tour with Picnic? During this interesting tour in the nature, you will have great sightseeing and other activities to enjoy. You will get your bearings through the beautiful gorge, enjoy a cruise that may reveal dolphins along the way, discover the local wildlife and more. More so, you will lay eyes on plant species inhabiting this part of Tenerife. Furthermore, you will learn a lot about Tenerife Island itself. If the weather serves you well, take a chance and refresh yourself with a swim at the beach of Masca. What Tenerife Masca Gorge 1-Day Hiking Tour with Picnic Includes? The tour of the Masca Gorge includes transfers from hotels in South Tenerife. Trip by a boat is a part of the hiking tour of the gorge. Each participating person receives snacks, fruits and a small quantity of water (0.5l). On this tour, the expert guide will accompany you. Hike through the Masca Gorge isn't particularly demanding, but make sure to have an appropriate footwear. Also, see that your shoes are waterproof, especially after rains, because the path tends to be water itself then. Travelers Reviews about Tenerife Masca Gorge 1-Day Hiking Tour with Picnic? The current rating of this activity is 4.7 on Get Your Guide and 4.5 on TripAdvisor. Travelers that joined this tour had a great time for the most part. They enjoyed seeing beautiful landscapes and plants, and a boat ride. If you suffer from disability issues, this tour isn't suitable for you. You can enclose either printed or electronic voucher to take part in the hike through the Masca Gorge. You receive the full refund in case of timely cancellation of this activity. Good, waterproof, footwear is essential for the hike through the Masca Gorge. If you suffer from any problems that affect your legs, you should skip this guided tour. Because of steepness of the hiking route, this activity isn't suitable for very young kids. Albeit the refreshment is available, you should bring some snacks and water. Transfers are available from hotels in Los Cristianos and Las Americas areas. Duration: The duration of the jeep safari of Mount Teide and the Masca region is approximately 7 hours.